Adorable and chic these Baby Buche De Noel are a real Show Stopper! 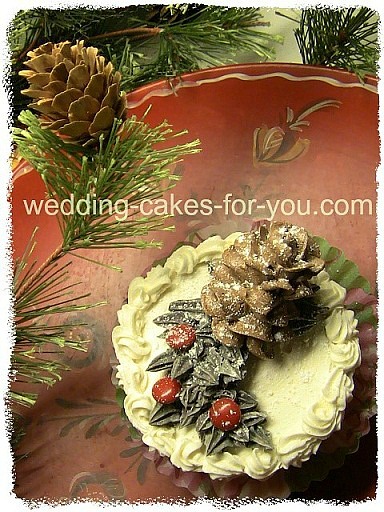 A great Christmas cake decorating idea for you. If you are planning a small dinner party I would recommend these highly. In small numbers they are very do-able. 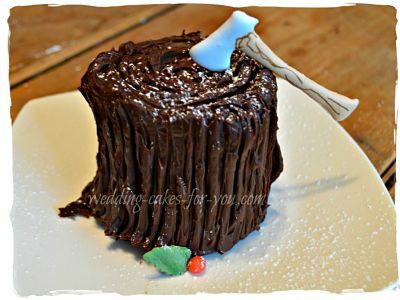 You can use my scratch cake recipes or make it super simple and purchase pre-made filling and frosting, make the cakes from a box cake mix and even purchase candy decorations. Use your own unique ideas for making these wonderful individual desserts. The video has instructions for making one of these mini Buche De Noel from start to finish. NOTE: I like to call them Sweet Stumps. 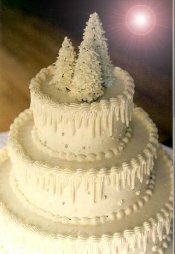 The video shows how to make royal icing axes, but you could also make snowflakes (my snowflake video is here) Meringue mushrooms with tiny fresh fruit and greenery would also be gorgeous in place of candied ones. One 8 inch layer of cake ( I used coconut) Link to all of the scratch recipes. 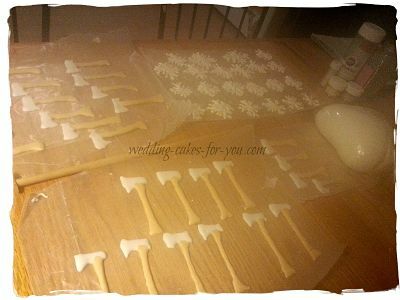 Waxed or parchment paper for piping the royal icing transfers. One batch of royal icing. One batch of chocolate ganache. Filling of your choice (I used two flavors)-Pineapple and coconut cream cheese. NOTE: The links to corresponding videos are in the video tutorial for you in the form of Annotations. If you have a YouTube channel change your settings so you can see the annotations that I provide. 6 inch cardboard round - optional. Powdered sugar and a sifter for making snow. Fondant, gumpaste or almond paste for leaves and berries. The leaves are made using the WILTON flower making set which contains the Holly leaf cutters. You can cut them by hand if necessary, or use real greens. The berries are Marzipan a.k.a. Almond paste. 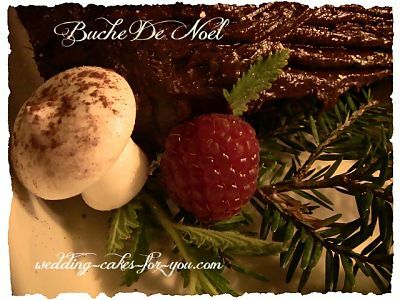 If you are making a single Buche De Noel you will need to bake one layer of cake. The photo here show many cut outs as I was making them for a large dinner party. Once baked and cooled, use a round cutting tool to cut out 2 rounds. I used a 3 inch pastry cutter to cut the rounds in the picture. If you don't happen to have a cutter you can probably find something around your kitchen that is similar in size to cut your circles with. Once cut, wrap and refrigerate or freeze your mini rounds. Make your filling and frosting. Use my recipes or your favorite. Make a batch of ganache. NOTE: How much chocolate ganache you need depends on how many yule logs you are making. One of these little darlings needs quite a bit of covering. Let the ganache cool to spreading consistency before using. To quicken up the process of cooling, place the bowl of ganache in a cold water bath and stir until it thickens up. If it gets too hard then gently heat it in microwave or on top of a double boiler. 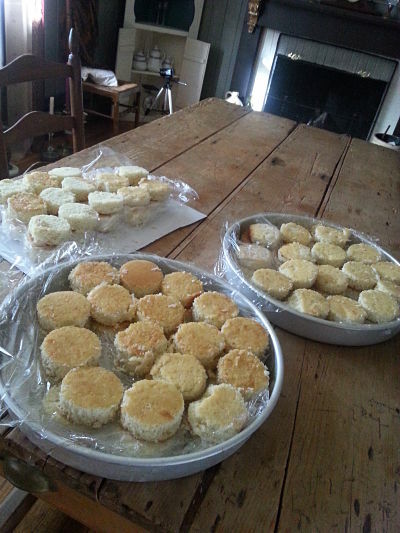 Remove the cakes from the freezer and fill, re wrap and freeze or refrigerate again until the filling sets up. 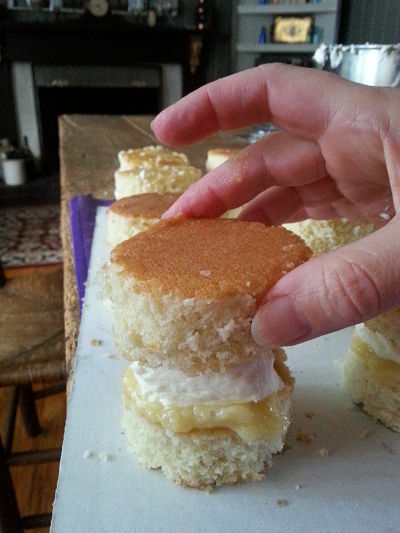 Once set up you can remove them again from the freezer and crumb coat to hold the cake and crumbs together. Your cakes are now ready for the final ganache frosting. Put a generous amount of the chocolatey goodness and coat it well. pile on some more and use a fork to make the bark impressions. The final and most satisfying step is to add the sweet little decorations. Keep these refrigerated, covered in the fridge for up to a week.